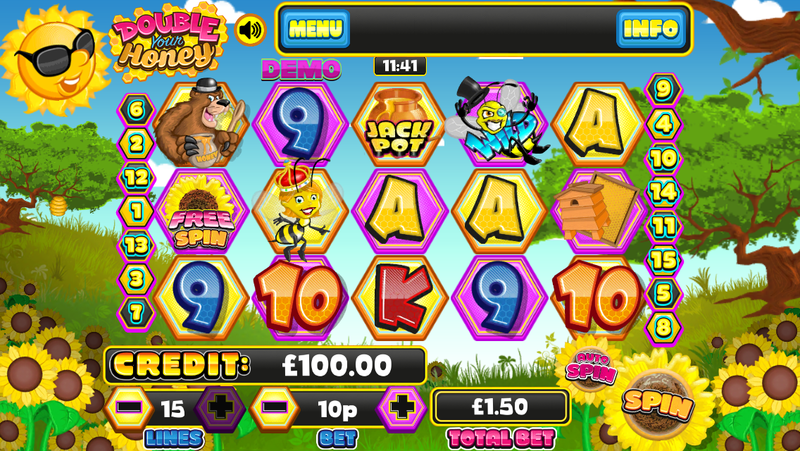 A buzzing new slot from mFortune, Double Your Honey is packed with features! Enjoy 80 extra spins at mFortune casino! This deliciously punny title is the latest slot in mFortune casino's line-up of downloadable slots. Double Your Honey is a sunny, aesthetically appealing game that gives players just what they want — bonus games, wild symbols and all can be played from as little as 2p per spin. All in all, this new slot will make an excellent edition to your smartphone, but what else does it offer? Are the winnings themselves anything to get excited about? Well, even they aren't entirely massive, let's say this game has impeccable graphics and a super fun storyline. The moment you open up Double Your Honey, you're treated to an immensely colourful game that will look awesome on your smart phone. But looks isn't everything and that becomes apparent the moment you start playing. The reel doesn't “spin” as such, but when you press the spin button, a swarm of bees hurries onto the screen to clear away the reel and replace the symbols with new ones. The animation of this alone is stellar and reminds us of another recent mFortune release that was the Gold MacDonald mobile slot. The features that accompany Double Your Honey may not be numerous, but they are brilliant regardless. The smooth graphics are just an added bonus. The game can be downloaded from the iOS App Store or the Google Play Store and is playable on 99% of all devices. Let's begin by saying that the game has a couple of bonus games that'll be sure to have you back wanting more! While playing, players will get an immediate sense that they will be hooked to this game. It's in mFortune's nature to create such titles that fit in your pocket and this one is no different. And once you spin the reel, you get a real buzz out of doing it (pun fully intended). There's no particular storyline here but, really, who needs one? And mFortune take every opportunity to take advantage of their theme. Each symbol, rather than simply being round or square, is honeycomb-shaped (hexagonal) and bees populate the reel as easily as they do the hive. The queen bee, however, is where she's supposed to be — at the heart of the hive in the Queen Bee mini bonus game. The sound design helps with all the colours and animation too with an upbeat tune and the gentle buzz of the honey bees in the background. Each bee looks the same, but then so they do in real life. It's been mentioned, but Double Your Honey isn't exactly numerous in terms of its features. It only has two bonus games and that's really it. But what it does offer with those games is what counts and we'll look into them in more detail in a moment. For now, let's discuss the base game and what players can expect from that. The gameplay mechanics are incredibly simple and if you're the conservative player who doesn't like too much dynamism to their slot reel than this is the one for you. Don't fix what isn't broken, right? But the bee theme may understandably get a little too cutesy from time-to-time and therefore get on your nerves. Then again, it isn't overdone. It's tolerable. Anyway, the simplicity of the game itself more than makes up for it. You almost forget that it's about bees for a while. So although the game is simple and good, it isn't anything ground-breaking. It does play it a little safe and that may have you believe that we think less of this game because of that but, honestly, it's so charming we hardly care. Anyway, not every slot has to be ground-breaking. We're just glad that mFortune stick to what they know and focus on making a game that works. What's so great about the two features, apart from being obviously appropriate to the theme? Probably the fact that they multiply your already big base-game win by quite a substantial amount. All it takes is to align the correct symbols and, although not easy, this feat is firmly within the realm of possibility. The first “bonus round” of the game is the Queen Bee feature where a female queen with a crown on its head (a very literal interpretation, but whatever) spins the dial around a wheel with a 50/50 chance of doubling your wager or letting you have what you already have. So even if you don't score a double, you still win! You can activate the Queen Bee feature by gaining a combination of queen symbols on the reel. It's an excellent bonus game that really adds to the fun factor and gives you enormous satisfaction when things go your way. It may not be the highest-return based game out there (some have 5-6x your wager) but it's still good nevertheless and the the satisfaction is present. As for the Beekeeper mini-game, that comes when you have two or more winning symbols on an active winline. The more symbols you have, the more extra spins you'll get in the mini-game and make sure you make each one count. 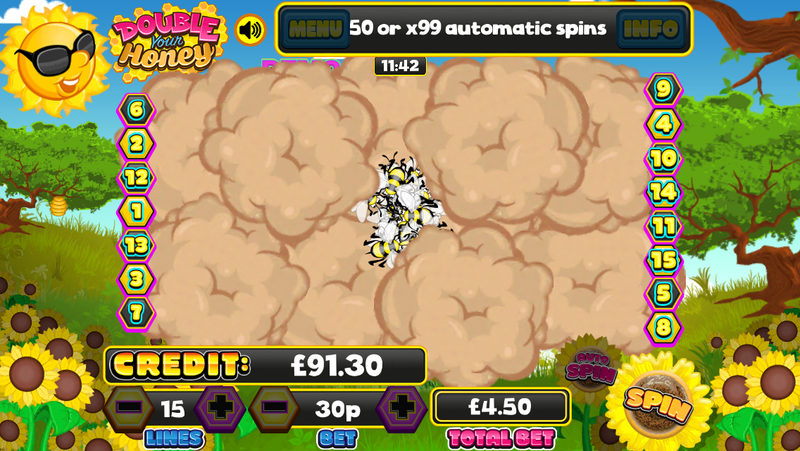 Once you're in, shake your device or press the spin button to clear the screen the remaining bees will then form a wheel and wherever the arrow lands on that wheel you could massively increase your wager by up to 8x. As you can probably tell, this is a major contributing factor in helping players score a massive win. And it's super easy to do! Simply score two or more of the same winning symbols and you too could get up eight times your wager! Of course, 3.5x isn't bad either. Want to play Double Your Honey? Double Your Honey is a sweet mobile slot with plenty of beelightful action and features! Claim no deposit bonus now! Double Your Honey Well, mFortune have done it again. They won us over! This fully downloadable game not only has charm, but the potential to earn big as well. The bonus games make a nice compliment to the overall base game and are fairly easy to obtain too, presenting great player satisfaction. The one and only thing that we might complain about is that we want more from this game. More features would mean more money for the player. But let's not get too greedy. The features, as they are, are pretty solid and great on their own. Adding more could amount to overkill on the developer's part. But, hey! We wouldn't complain. And with mFortune's free £5 welcome deposit, we wouldn't say that that's a bad combination either. While you're at it, put down your first deposit and you'll receive a 100% matching bonus on top of that too. And don't forget that all new games are featured with 80 extra spins, no deposit required and you'll get to keep whatever you win, so hurry down to mFortune and download this game today!